Is There an Investment Better than Crude Oil? Is there an investment better than oil? It seems to many, oil has it all. Oil is a popular way to protect against inflation. It’s truly a liquid asset. Someone, somewhere, always needs oil. It can be bought and sold very easily. Also, oil is tough not to keep track of. The financial media gives us daily updates on gasoline prices. On top of that, even slight increases in demand can send oil prices soaring. For instance, world oil consumption increased from 76 million barrels per day in 2000 to 87 million barrels per day in 2008. Meanwhile, oil prices climbed from around $30 per barrel in 2000 to average more than $80 a barrel last year. A 14% increase in demand led to more than a 150% rise in prices. There’s the “Peak Oil” argument too. Which makes sense in there isn’t too much “easy” oil left, but there’s still plenty of oil in the world. It’s just more expensive to produce. Also the truly economically viable alternatives will come along, but they’re realistically years away from mass implementation. Remember, it took a couple of decades for the world to get rid of its addiction to whale oil after Peak Whale Oil. So oil doesn’t look too bad. At $74 a barrel though, it’s not too good to pass up either. There is, however, one energy sector which is looking much better than oil at the moment. A sector growing much faster than wind and solar power. A sector which doesn’t require any government legislation (ref: Cap-and-Trade) to make it economically viable. And one that has China, ExxonMobil, and other deep-pocketed energy heavyweights cutting multi-billion dollar checks every few months. And best of all the investment opportunities will be limited. So when the big money wakes up to this high-growth energy sector, their will only be a few options for them to plow money into. I’m talking about liquefied natural gas, or LNG. Of course, the most attractive part of investing in LNG (we’ll look at the two best ways to do that in a moment) is that it’s still relatively small. And since it is small, it can grow very quickly. U.S. (LNG) imports to increase to about 500 billion cubic feet (Bcf) in 2009, up from 352 Bcf in 2008, and rise to about 740 Bcf in 2010. That’s a two-year increase of 110%. And it’s only going to get bigger as time goes on. Consider this. Last week, PetroChina (NYSE:PTR) announced it had cut a $41 billion LNG purchase deal with ExxonMobil (NYSE:XOM). The deal says PetroChina will purchase $41.29 billion worth of LNG from Exxon’s stake in the massive Chevron-operated Gorgon LNG Project in Australia. The deal guarantees future sales from the project. It’s already sold. It’s like opening a factory, but you already have orders for the next 20 years. This deal though is just one of many already in place. And it’s only one of many more to come. Meanwhile, the countries which have a lot of it – Australia, Papua New Guinea, and Indonesia – are capable of producing far more than they are able to consume. The only realistic solution is more and more LNG imports. The Middle East continues to move into the LNG market too. A few days ago the Ras Laffan LNG Company in Qatar announced its latest LNG project has come on line too. This project matches the largest LNG production in the world. And there’s more on the way before 2009 is out. Now, the LNG boom is in full swing and more and more deals are getting done. The thing about the growth of LNG is that it makes natural gas, for the first time in history, a truly global commodity. In a matter of time, LNG shipments will be free to find the highest price in the world, just like oil. It’s a dramatic shift which will create a lot of winners and losers. Think about the fate of typewriters, Polaroid cameras, and Walkmans. They’ve been outmoded through change. Typewriters were replaced by word processors which were replaced by PC’s. Walkmans were replaced by portable CD players which were replaced by iPods. It’s the basic product lifecycle. A technology is introduced, it gains acceptance from “early adopters,” and then eventually gains wide acceptance and becomes the standard in itself, until something new comes along. The changes were opportunities for the innovators and catastrophic for the old leaders. The LNG boom will have similar consequences and create its own set of winners and losers. Now, with LNG becoming a truly global commodity, capacity coming on line quickly, and a general economic malaise, there will be supply gluts. The gluts are already starting to appear. It’s not just China though. Bloomberg reported yesterday, “U.K. gas plunges on excess LNG, supplies from North Sea, Norway.” The U.K. is in terrible shape economically and now all of the LNG import facilities it built over the past year have created a significant glut. The current cost of a million cubic feet is about $1.50 – nearly half the price it is in the U.S. 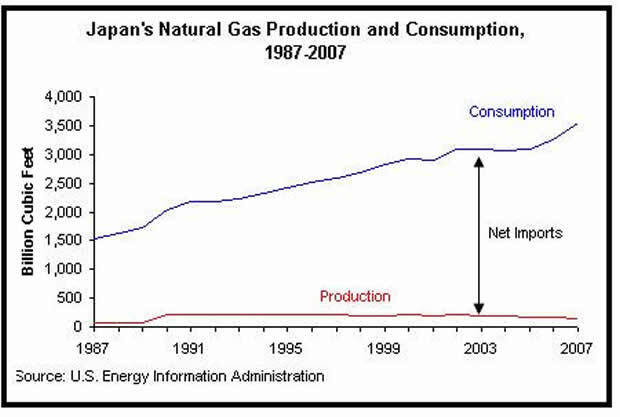 The top outlet for excess supply is and will be the world’s largest consumer of natural gas – the United States. That’s good news for consumers - there’s more competition in the natural gas market. It’s bad news, however, for the major natural gas producers in the United States – there’s more competition. And it couldn’t be coming at a worse possible time. The number of natural gas rigs operating in the U.S. has been cut in half. Natural gas storage levels are hitting five-year highs. And hopes for a really cold winter, which drives a lot of natural gas demand, are a quickly fading. That’s why natural gas prices have finally broken down below the $3 mark. We’ve been watching them closely. They fell to $3.25 and then rocketed back up to around $4 a few times since last winter. But now, we’re in the second half of 2009, and the time for playing around in the North American natural gas market is over. LNG-laden ships are already headed to U.S. shores. This is going to make it even tougher for domestic natural gas producers. Now, I’m not saying they’re going to simply fall from here, but the upside will be quite limited. After all, any significant uptick in natural gas prices will surely be met with an influx of LNG. Although the short-term picture for natural gas may not be too bright in the U.S., it’s not going to have much of an impact on LNG projects. The simple reason is because it takes so long to build an LNG plant. Some of the larger LNG projects aren’t expected to be completed until 10 or 12 years from now. So the LNG industry isn’t focused on the short-term. It’s focused on the long-term demand for natural gas – the very long term. That’s why I still see a few opportunities in the global LNG boom. One way is to invest in the countries with too much natural gas. This is the high-risk/very high-reward way to get in on the LNG boom. Currently there are a few very small companies which have been developing natural gas fields in Australia, Indonesia, and Papua New Guinea. Most of them are trading at pennies on the dollar relative to their North American counterparts. But thanks to the build out of LNG infrastructure, they’re likely to be going head-to-head with the likes of Chesapeake Energy and EOG Resources which are sporting $15 billion and $19 billion market caps. That’s where you’ll find the truly exceptional risk/reward opportunities out there. For instance, we’ve found a small Indonesian company that’s so undervalued we’re looking at a 100% to 600% payoff within the next six to 18 months in our small and microcap-focused research service, the President’s List. The other way to get in on the LNG boom is from the companies which provide the “picks and shovels” to the boom. There are quite a few companies which have developed the expertise in building the LNG plants. Regrettably, most of the companies which are best suited for taking on the massive LNG projects are the big leaders like Schlumberger (NYSE:SLB) and Halliburton (NYSE:HAL). They’re going to get the biggest cut of the LNG infrastructure action. There are a few other ways, however, which are more direct. One of the ways that has caught my attention is with FLEX LNG (Norway:FLNG). This company is building mobile liquefaction plants - the plants which turn natural gas into LNG. These special LNG vessels will be able to move to wherever the natural gas is produced. It will be able to transform previously remote and unusable natural gas fields into economically viable LNG producers at a much lower up-front cost than many other traditional LNG plants can do. FLEX LNG may or may not be a “buy” at this point, but it is a great example of smaller innovative companies positioning themselves to capitalize on the LNG boom. It’s coming and it’s going to be a big industry in the years ahead. That’s why the window of opportunity in natural gas and LNG is still open. At the moment, the industry is going through a lot of change. Natural gas prices have been hit hard in the U.S. They’ve been hit a lot harder in other parts of the world. As LNG continues to grow, the regional differences in prices will be limited. And as we’ve seen with oil, the highest bidder sets the price, regardless of how high. Over the long run, natural gas will become a more suitable alternative to oil. Based on energy to price value, natural gas is as cheap as it has been in the past decade. It will take time – probably a lot of time – but natural gas’ time to shine will come again. Oil may be a 50/50 bet at this point, but the long-term outlook for natural gas is very bright. You just have to be selective about how you’re going to go about profiting from it. More importantly though, LNG is just another example of the bigger opportunities which are out there. The kinds of opportunities which won’t depend on a continued rally in the world’s stock markets either. It reminds me of something PIMCO’s Bill Gross wrote a few weeks ago. He was writing about investing in the “new normal” economy where growth is muted, unemployment is high, and the world economy will be dipping into and out of recessions over the next few years. Investors looking for love potions or successful investment strategies in this new normal economy dominated by deleveraging and reregulation must focus on some very macro-oriented ingredients as opposed to typical news-dominated minutiae. One of those “macro-oriented ingredients” will be the changing energy landscape. There will be many changes and just as many opportunities along with them. Whether it’s the boom in hybrid car batteries or the globalization of natural gas, there will be opportunities. The most successful investors over the next decade will be the ones who are able to isolate those opportunities.